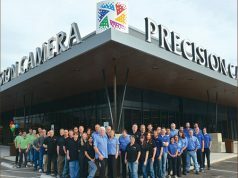 Las Vegas, NV—The imaging industry turned out on the evening of January 5, 2016 to honor four members of its community and one spectacular camera at the 50th Annual PMDA Awards Ceremony. 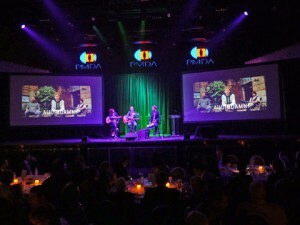 The Imaging Night event was held at The Foundry Hall in the SLS Las Vegas Hotel & Casino. 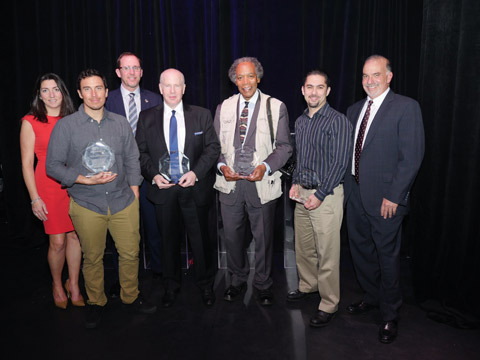 At the 50th Annual PMDA Awards Ceremony (L-R): Michelle Tramantano, PMDA program director; Visionary Photographer awardee Chris Burkard; Jim Malcolm, PMDA president; Person of the Year Matt Sweetwood; Lifetime Achievement in Photography Award winner John H. White; Herbert Keppler Technical Achievement Award honoree Berend Ozceri; and PMDA’s executive director, Jerry Grossman. Matt Sweetwood was honored as PMDA’s Person of the Year for his years of service as president of Unique Photo and for his involvement in the Josephine Herrick Project. 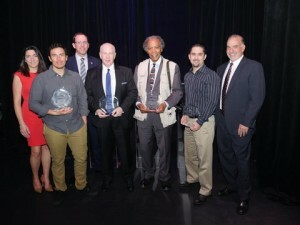 Pulitzer Prize-winning photojournalist John H. White, Eyefi cofounder Berend Ozceri and visionary surfing photographer Chris Burkard also received recognition at the gala. Up-and-coming Epic recording artists AudioDamn! opened the evening with a four-song acoustic set that impressed the crowd. than 160 guests and talked about the mission and accomplishments of PMDA. 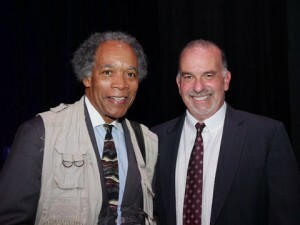 “Conversation, education, inspiration and giving back are the hallmarks of PMDA,” he said. He also acknowledged PMDA’s outgoing president, Dan Unger, for his years of service. Malcolm then introduced Jerry Grossman, PMDA’s executive director, who showcased PMDA’s Portraits of Love program. “We have already hit our goal of sending 10,000 free family portraits to deployed soldiers around the world, and with the help of our partnership with the USO, we’re setting our sights on 20,000,” he said. Grossman then welcomed Portraits of Love volunteer photographer John Bentham to the stage, who related some emotional stories of the many portraits he’s taken for the program. The award ceremony began in earnest when Sony’s Neal Manowitz introduced Visionary Photographer Award winner Chris Burkard. Burkard’s presentation and discussion of his surf images challenged the industry and all in attendance to experience the joys of taking those images. His images and uplifting demeanor left the crowd mesmerized. Following this, Eyefi CEO Matt DiMaria presented the Herbert Keppler Technical Achievement Award to Berend Ozceri, Eyefi’s cofounder. Ozceri reminisced about the early days of computing and reflected on the abilities we all have now to share images instantly. Jerry Grossman, PMDA executive director, with Lifetime Achievement in Photography Award honoree John H. White, whose emotional address to the crowd will be remembered for years. uraged the audience to “keep in flight.” He added that this award was “just as important as his Pulitzer,” as it embodied his lifetime of work. Popular Photography’s editor in chief, Miriam Leuchter, then came to the stage to announce the magazine’s coveted Camera of the Year Award. Announced for the first time at the PMDA event, the prize was awarded to the Sony a7R II, which brought those seated at the Sony table to their feet, celebrating the big win. Grossman then delivered a moving dedication to former PMDA board member Anthony Ruotolo, who passed away suddenly last June. A friend to most of the people in the room, Ruotolo was remembered as a tireless advocate for young photographers and a major contributor to the PMDA organization. The crowd offered a rousing standing ovation in his honor. Jim Malcolm, PMDA’s president, introduces the PMDA Person of the Year winner, Matt Sweetwood. 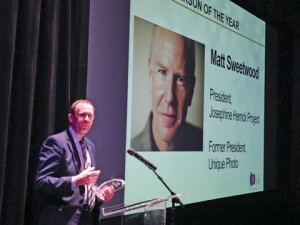 Malcolm then returned to the stage to present the Person of the Year Award to Matt Sweetwood. His acceptance speech spoke to the responsibility of the industry to give back and to his dedication to his family as his most important mission.